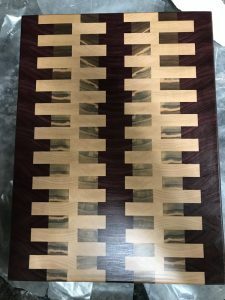 I am a woodworking hobbyist, having worked with wood the past ten years. I enjoy making large and small furniture items as well as cutting boards for home, family and friends. I recently purchased a Festool ETS 125 REQ 5 inch Random Orbit Sander. I have another 5 inch random orbit sander and a 6 inch random orbit sander, both from manufacturers other than Festool. While I have been pleased with the results from the already-owned sanders, I decided to take the Festool plunge and purchase the 125 orbital sander along with a CT Mini Dust Extractor for my small workshop. 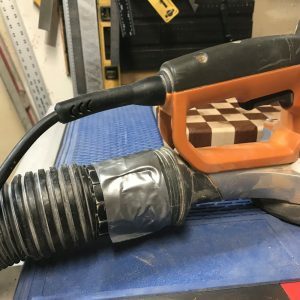 I had grown weary of duct taping various vacuum hose adapters to my shopvac and existing sanders, and wanted to have a cleaner work environment. 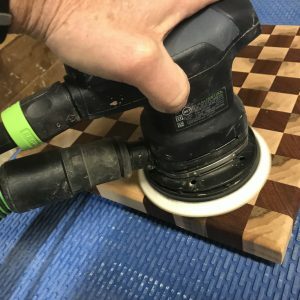 The Festool 125 Sander, when used with the CT Mini Dust Extractor, provided me with a cleaner work environment along with a pleasant surprise in efficiency. The duct tape only works so well! My reticence in purchasing the Festool sander and dust extractor was primarily due to cost. 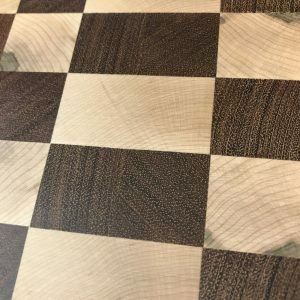 After purchasing and using the sander and extractor I can strongly recommend them – they were definitely worth the cost when considering their advantages. The biggest advantage is the reduction of sawdust filling the air and my lungs. The two work well in tandem; when the sander is plugged directly to the extractor it has the advantage of starting up the dust extractor a second or so afterward and shuts the extractor down automatically when turned off. There is almost no discernible dust coming from my work pieces. Although I had read about the longer life provided by Festool Sanding Discs, I was skeptical. Again, the comparably higher cost of such discs contributed to my reticence to invest in these Festool products. However after using the Festool sanding discs on several projects, I was totally impressed by how much longer they lasted in comparison to ones used with the other manufacturers’ sanders. I would say on average that I used one Festool sanding disc for every 3-4 used with the other manufacturers’ sanders. It’s a testament to the quality of those sanding discs as well as to the quality of the Festool 125 sander. I used the sander with 80, 100, 120, and 180 grit Granat discs and was totally pleased with the results. The Festool 125 sander is lightweight and can be held and controlled using one hand. Its orbiting motion speed is adjustable. The finish produced was excellent as long as I followed standard recommendations for progressing from lower to higher grits, with no visible scratches noticed. The Festool 125 sander came in a Systainer case and included a small dust bag (that I’ve never used the dust bag since I have the CT dust extractor), power cord, and edge protector. Now the Festool 125 is my go-to sander for finishing work!